Jamie Trevor Oliver was born May 27, 1975 in Clavering, Essex, England. Jamie grew up in Cambridge where his parents, Trevor and Sally, own a pub and restaurant called The Cricketers (still in business). When he was 8 years old, Jamie began working in his parent's restaurant. At age 11 Jamie could cut vegetables as well as any of the kitchen staff. In 1989, at the age of 14, Jamie formed the band Scarlet Division with composer/musician Leigh Haggerwood. Jamie began attending the Westminster Catering College at the age of 16. Later, he worked in France learning as much as he could before returning to London. His first job back was working for Antonio Carluccio as Head Pastry Chef at The Neal Street Restaurant (one of the best Italian restaurants in England).Here Jamie worked alongside Gennaro Contaldo, who Jamie considers one of his mentors. After The Neal Street Restaurant, Jamie worked 3 1/2 years at the famous River Cafe in London. It was here, Jamie says, where he learned "all about the time and effort that goes into creating the freshest, most honest, totally delicious food." The River Cafe was also his big break into television. The day after appearing in a documentary about the restaurant called Christmas at the River Cafe, five television production companies contacted Jamie about starring in his own show. He accepted an offer from Optomen Television to produce his first show The Naked Chef. The title is a reference to the simplicity of his recipes. Two seasons of the show, which also aired in the U.S., were filmed in 1998 and 1999.Jamie's Kitchen was Oliver's second television series. The show, produced by Channel 4, is a documentary that follows Jamie as he mentors 15 unemployed youths (1000 applied for the position). Jamie trains the youngsters to be professional chefs and help staff his first restaurant, Fifteen, a not-for-profit endeavor. The restaurant is still open for business and on its third class of students.Later, Jamie would film another charitable project, Jamie's School Dinners. This four part series documents Jamie as he takes responsibility of running the kitchen at Kidbrooke School, Greenwich. It also showcases the Feed Me Better campaign, his crusade to change the poor eating habits of children and improve school meal systems. The campaign was directly responsible for the British government's pledge of 280 million pounds (over 3 years) to improve school dinners.Jamie's latest series (2002-present), Oliver's Twist, appears on the Food Network. The show follows Jamie as he shops for the best food in London and takes it home to cook for his friends. In 2005, Jamie's Great Escape premiered. The show is a travelogue of Jamie's trek across Italy (in a camper van) as he tries to rediscover his joy of cooking. Aside from his many cookbooks, Jamie has a regular column in the Saturday Times Magazine, is a monthly editor of Marie Claire (UK), and is the food editor for Britain's GQ magazine. In 1999, Jamie and his staff of 15 students were invited to 10 Downing Street to prepare lunch for the British Prime Minister, Tony Blair, who was entertaining the Italian Prime Minister. In June 2003, Jaimie was awarded an MBE (Member of the Order of the British Empire) in the Queen's Birthday Honours List for services to the Hospitality Industry. 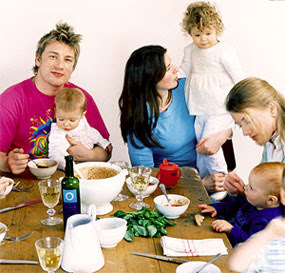 On June 24, 2000 Jamie married his childhood sweetheart, Juliette (Jools) Norton. They have two daughters, Poppy Honey (born March 2002) and Daisy Boo (born April 2003).